Is Baseball Moving Beyond Old Guys In The Dugout? Craig Counsell is not a normal manager. Earlier this week, Counsell was named the new manager of the Milwaukee Brewers after Ron Roenicke was fired. Counsell is 44 years old and a former utility infielder for the team; before this week, he had never managed at any level. But what’s most surprising — and what makes him atypical — is that Counsell only hung up his spikes four years ago. Since the early days of baseball, the population of managers who were former MLB players1 has been getting older and further removed from their playing days.2 That’s partly because player-managers went extinct, but the pattern continued even after Pete Rose, the last player-manager, left baseball. In 2011, the trend hit its peak, with the average manager-who-used-to-be-a-player more than 23.5 years removed from the end of his major-league playing career. Now, though, young managers are experiencing a mini-boom. Counsell is a good example: He didn’t pay his dues in the traditional manner, working his way up through the minors like Joe Maddon or serving as apprentice to an established coach, like Don Mattingly did with Joe Torre. He spent the four years after his playing career working in the Brewers’ front office as a special assistant to General Manager Doug Melvin. Three years ago, the St. Louis Cardinals’ Mike Matheny was the new kid on the block only six years after he retired. One year later, the Detroit Tigers hired Brad Ausmus, three years off his last appearance in the majors. Similarly, last year the Tampa Bay Rays hired Kevin Cash to fill Joe Maddon’s vacated position, four years after Cash had last played for the Boston Red Sox. Thanks to all these greenhorns, the average manager was only 18.5 years removed from his playing career in 2014, five years less than in 2011. This is the largest three-year shift in manager experience levels since 1950, when managerial positions varied rapidly. We may be seeing a historic inflection point. 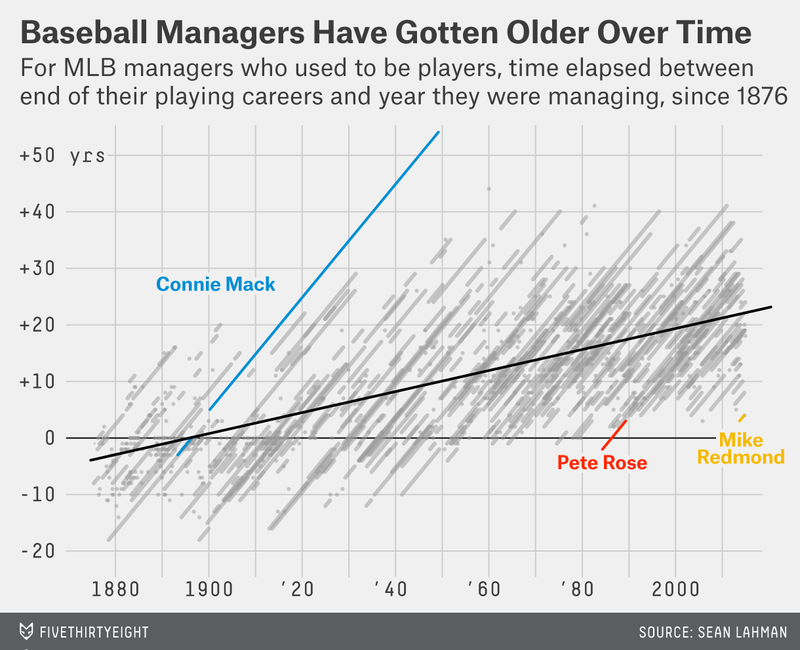 So despite the long-term trend, the ranks of baseball’s managers have been given a recent infusion of youth. We’ll need more data before we can tell if these counterexamples are part of a genuine reversal of a century-long progression or just a handful of qualified youngsters who happened to come on the market at the same time. If the swing toward recently retired players holds, we’ll have to face the intriguing and as-yet-unanswered question of why front offices suddenly prefer youth over experience. Eighty-five percent of managers appeared in at least one game at the major-league level. The following analysis uses data from Sean Lahman’s database.